Watching the Boston marathon yesterday and tracking my friends who were running got me so excited for Lansing! Congrats to Kristy on her first Boston finish and to my speedy coach MB (2:58 in the heat!) and all the runners from my Lifetime running group. I was so impressed by everyone who got out there and finished in those miserable running conditions. I LOVE the marathon. I love challenging my body and mind. I love the nervous energy and excitement at the starting line. I love when it all comes together and I have a great race. Even though I hate it at the time, I even love those marathons when nothing seems to come together and it’s a crappy race. Because no matter what, it’s 26.2 miles of running. And I love that I can run for hours on end. When I race a marathon it’s about more than the “me time” that I love on my training runs. It’s my “find out about me” time – where after months of training and hard work I have the chance to put it all together and see how strong, mentally and physically, I really am. Because during every single marathon there are low points, times when you want to quit, slow down, even cry. And I love powering through those moments. I love the feelings of strength and accomplishment that the marathon always brings me. I can’t wait for Sunday! I’ve been stalking the Lansing weather forecast and it looks good so far (36 at start, 54 for high; partly sunny). Although I’m sure the Boston runners thought the same thing last week at this time. I know it’s still too far out to accurately predict the weather. Whatever weather race day brings, I’ll roll with it. 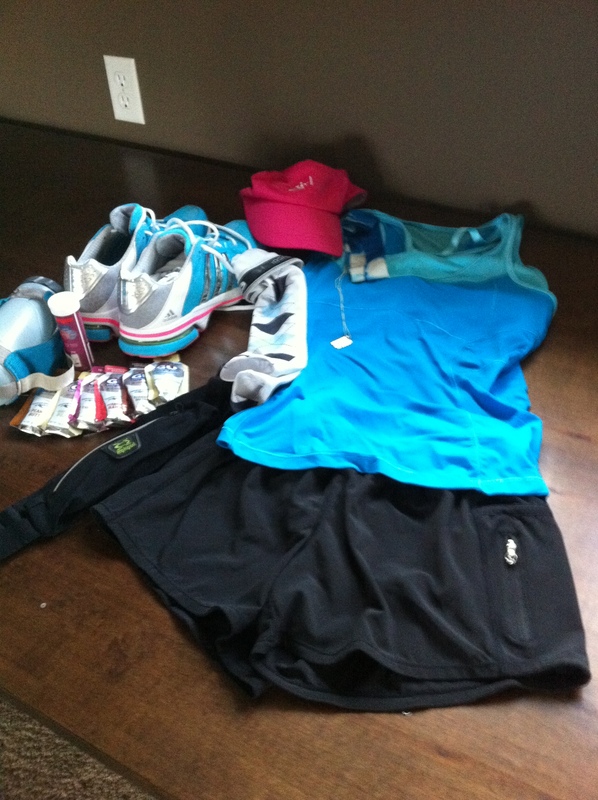 My race outfit won’t change even if the weather changes (though the arm warmers and gloves may not be necessary). I’m mixing up the color scheme this time (but still have my necessary pink!). Yay – sounds like PERFECT weather (and no, they were already predicting 80s by this time last week). You are going to knock it out of the park, I know it! !